Any wedding at the beautiful Terranea Resort in Rancho Palos Verdes is bound to take breath away, but Jessica and Rob's wedding will forever hold a special place in our hearts! We are so honored to have been a part of this event and are extremely happy to be able to offer it as a full feature blog! On this summer day in July hardly anyone would have guessed for rain, but sure enough on July 19 mere minutes before Jessica walked down the aisle, it began to drizzle! Although it may not have been ideal for the wedding guests, the pictures came out beautifully and our flowers sure did love the extra water! 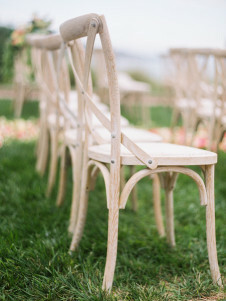 Jessica and Rob's wedding was very romantic, free-flowing, and organic. We used tons of greenery and garland- draped above the altar, down the aisle, across the stage, above the head table- you name it! We will forever be in love with this wedding! Everything from the venue just feet away from the pacific ocean to the romantic ceremony to the vintage reception was perfect! 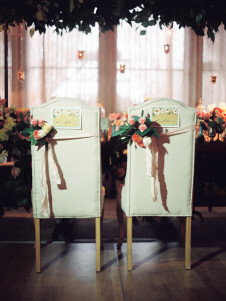 Our mixed rose petals on the aisle used all of the colors used in the garlands hung on the chairs of the ceremony. Take note of the beautiful draping we did in gold fabric above the altar and our three chandeliers in between the swooping fabric. Don't you just love our "roped" off aisle using smilax garland? Our garlands were made up of a few key components: tulips, spray roses, dahlias, roses, bay laurel, and lemon leaf. Although the flowers were primarily red & pink, we threw in the occasional white and cream addition! Jessica had the most beautiful bouquet! We think it tied the ceremony to the reception perfectly using the same greenery and florals as with bursts of succulents. Also, take note of the timeless handle! We wrapped it in a gorgeous cream ribbon and added a beautiful pearl embellishment. Take a look at the awesome bar display below! Below the counter, we draped smilax garland. Above the actual bar, we added a large floral piece with smilax draping down in front of the shelves. To bring drama, we added large pieces of willow branches sticking out from the top of the piece. The reception really took the ceremony to the next level! We continued to use greenery and garlands to bring the beautiful garden-y feel of the ceremony to the Catalina Room of Terranea Resort. We used our custom t-structures and covered them with bunches of silver dollar, bay laurel, and lemon leaf greenery. Then, we strung dozens of candles to rest at eye level while guests dined. At the tabletop, we scattered vintage lanterns with lush florals and draped more gorgeous garland up and down the length of the tables. Our low centerpieces surrounded by candlelight and antique lanterns. They contained a brilliant combination of spray roses, succulents, silver dollar greenery, tulips, and more. We just loved them! The head table featured custom chair treatments with small and petite floral bouquets tied with a light pink ribbon as well as the "Mr." and "Mrs." signs. Napkin treatments featured a sprig of fragrant bay laurel and a large dahlia. So pretty! 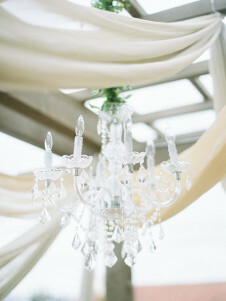 For the stage- yes, you guessed it- more of our gorgeous garland!! We draped this floral masterpiece above the antique and aged wooden stage front. With smilax draping down from the beautiful mixture, the band played the night away! Lastly, take a look at Jessica and Rob's gorgeous wedding cake! It continued the vintage theme with an all-white color palette and delicate piping, however we added more sprigs of fragrant bay laurel in addition to a beautiful combination of coordinating florals! Jessica and Rob were pretty ecstatic about how it turned out- and so were we! This beautiful cinematography below is courtesy of Forward Motion Production! Check it out and be prepared to fall in love with not only this amazing couple, but their spectacular wedding as well.